The next time you find yourself making the same ole, same ole pasta or veggies or rice, boost your meal's flavor with The Tasty Trio: roasted garlic, capers, and pine nuts. I love this combo. 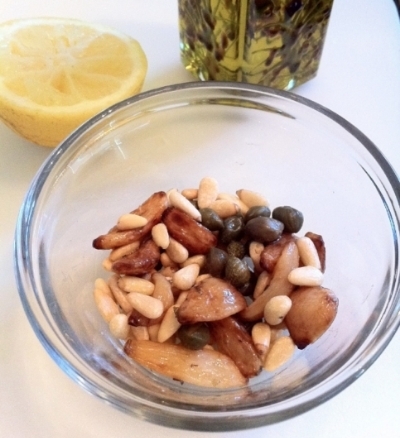 The sharp pungent capers are tempered by the mellow, rich flavor of the roasted garlic, while the pine nuts add a nice textural contrast. Just toss them together and add to your dish toward the end of cooking. You can add The Tasty Trio to almost anything- pasta, quinoa, wild rice, chicken, salmon, tuna, eggs, veggies. Last night I added it to pan roasted cauliflower and broccoli. Yum! Posted on January 8, 2014 by Catherine Ruehle.